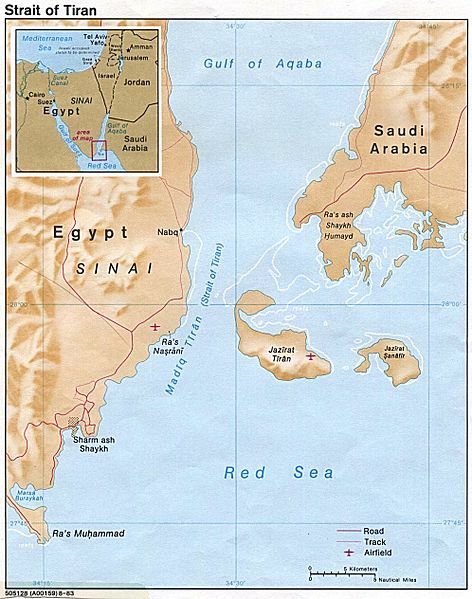 The Saudi–Egypt Causeway is a proposal to link Egypt and Saudi Arabia with a causeway and bridge. The entire project is expected to cost about 3 billion US dollars. The causeway would link Tabuk to the Red Sea resort of Sharm el-Sheikh on the Sinai Peninsula and would pass through Tiran Island at the entrance of the Gulf of Aqaba.We propose that the causeway would have a railway line in parallel with the lanes. This will integrate the New High Speed Railway proposed (see Railway Project) with the Saudi High Speed Railway. * Will strengthen Arab free trade. * Will not only facilitate transport between the two countries but would “have a great socio-economic and political impact on the region. * Many Saudi businessmen will support the project as it will facilitate transportation of goods, especially vegetables and fruits and other agriculture products. * It would also strengthen relations between Saudi Arabia and Egypt. * The causeway will benefit many countries in the Gulf and Africa and will bring about a dramatic change in transportation between the two continents. Funding Source: The people (share holders) + Egypt and Saudi governments + Private investors.